An additional verification that low temperature baro-acoustic decrepitation events are caused by gas rich fluid inclusions is provided by the work done by professor Damien Gaboury of the Universite du Quebec at Chicoutimi. He and his co workers have built an instrument to analyse gases by quadrupole mass spectrometer as they are released during heating of a sample in vacuum. This instrument slowly heats a sample while monitoring the vacuum pressure to quantify the amount of gas released and passes that gas into a sensitive mass spectrometer to identify the gases. 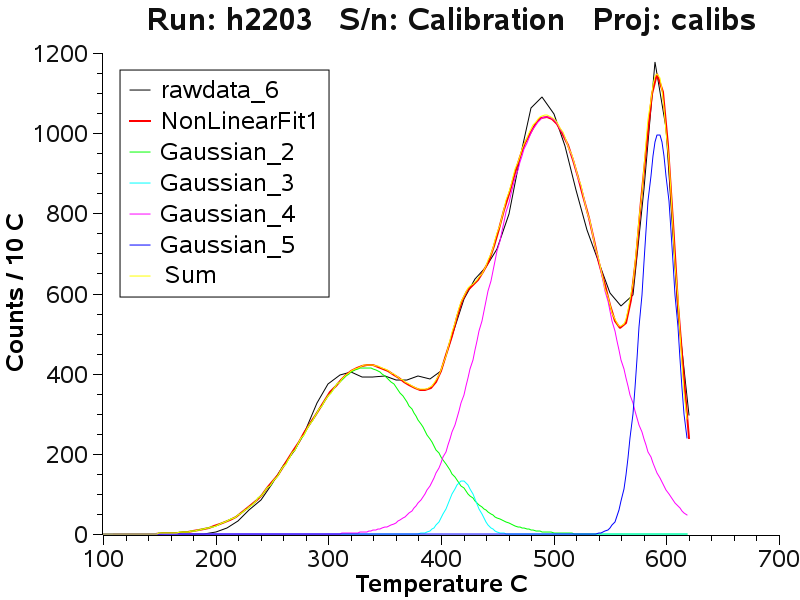 The calibration standard sample can be represented by 3 or 4 overlapping gaussian populations of inclusions. Low temperature baro-acoustic decrepitation peaks are indeed caused by the decrepitation of CO2 rich (gas rich) fluid inclusions and the baro-acoustic decrepitation method can be used to recognise such gas-rich fluid systems in an exploration programme without resort to tedious and/or expensive micro analytical work. In this sample, the first population peak, centered at 333 C , corresponds with the strong release of CO2. 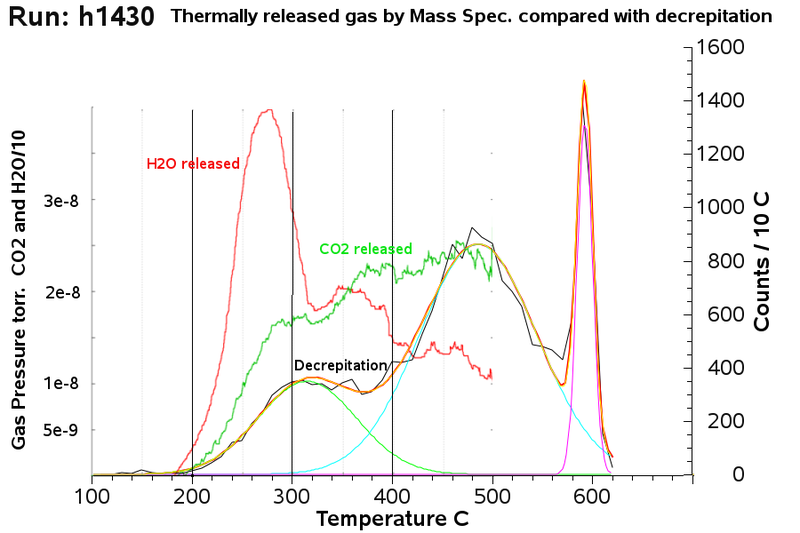 The intense peak centered at about 490 C is still associated with CO2 release, but is most likely caused by the decrepitation of predominantly aqueous inclusions. The fourth peak at 593 C is related to the quartz alpha-beta transition as discussed here. Mass Spectrometric analysis of volatiles in fluid inclusions decrepitated by controlled heating under vacuum. Damien Gaboury, Moussa Keita, Jayanta Guha and Huan-Zhang Lu, Economic Geology v 103, pp 439-443, March-April 2008.